Viewing entries tagged with ssl. Return to full view. Posted on Aug 15, 2017 at 21:23. Tags: postgresql, intrastructure, ftp, ssl, security. As Joe just announced, all ftp services at ftp.postgresql.org has been shut down. That of course doesn't mean we're not serving files anymore. All the same things as before area still available through https. This change also has an effect on any user still accessing the repositories (yum and apt) using ftp. There are multiple reasons for doing this. One is that ftp is an old protocol and in a lot of ways a pain to deal with when it comes to firewalling (both on the client and server side). The bigger one is the general move towards encrypted internet. We stopped serving plaintext http some time ago for postgresql.org, moving everything to https. Closing down ftp and moving that over to https as well is another step of that plan. There are still some other plaintext services around, and our plan is to get rid of all of them replacing them with secure equivalents. Posted on Oct 17, 2014 at 07:41. Tags: encryption, postgresql, security, ssl, tls. The POODLE attack on https (the attack is about https, the vulnerability in SSL, an important distinction) has received a lot of media attention lately, so I figured a (very) short writeup was necessary. The TL;DR; version is, you don't have to worry about POODLE for your PostgreSQL connections when using SSL. The PostgreSQL libpq client in all supported versions will only connect with TLSv1, which is not vulnerable. The PostgreSQL server prior to the upcoming 9.4 version will however respond in SSLv3 (which is the vulnerable version) if the client insists on it (which a third party client can do). To exploit POODLE, you need a client that explicitly does out-of-protocol downgrading. Something that web browsers do all the time, but very few other clients do. No known PostgreSQL client library does. To exploit POODLE, there needs to be some persistent secret data at a fixed offset in each connection. This is extremely unlikely in PostgreSQL, as the protocol itself has no such data. There is a "cancel key" at the same location in each stream, but it is not reused and a new one is created for each connection. This is where the https attack typically uses the session cookie which is both secret and fixed location in the request header. For a really good writeup on the problem, see this post from PolarSSL, or this one from GnuTLS. Posted on Jul 14, 2014 at 14:13. Tags: extensions, logging, postgresql, security, ssl. PostgreSQL can, as many other products, use SSL to secure client/server communications. It can be configured to be optional or required, to require a client certificate, or even to use the SSL client certificate to log in. However, the DBA tools are currently a bit lacking in this regard. In particular, there is no way for a DBA to see what SSL parameters are in force (or indeed if SSL is enabled at all) for an already existing connection. There are multiple ways to see the status of a specific connection (such as the libpq PQgetssl() function, the psql startup message or the sslinfo module. Unfortunately all these methods have one thing in common - they are only available to the process making the connection to the database, not to a DBA inspecting the system from the outside. But this can still be a bit of a pain to figure out for existing connectioons of course. The extension is available from my github account today for existing version of PostgreSQL, under the standard PostgreSQL license. My plan is to work on having a similar view included in PostgreSQL 9.5 by default, but it's unfortunately too late to include it in 9.4 at this point. Posted on Apr 8, 2014 at 08:50. Tags: debian, encryption, pgcrypto, postgresql, release, security, ssl, ubuntu. Is your PostgreSQL installation vulnerable to the Heartbleed bug in OpenSSL? The TL;DR; version is "maybe, it depends, you should read this whole thing to find out". If you are vulnerable, it is a high risk vulnerability! The slightly longer version is that it will be vulnerable if you are using SSL, and not vulnerable if you are not. But the situation is not quite that easy, as you may be using SSL even without planning to. PostgreSQL also not provide any extra protection against the bug - if you are using SSL, you are vulnerable to the bug just as with any other service. As the bug is in OpenSSL, however, what you need to get patched is your OpenSSL installation and not PostgreSQL itself. And of course, remember to restart your services (this includes both PostgreSQL and any other services using SSL on your system). You will then have to consider in your scenario if you have to replace your SSL keys or not - the same rules apply as to any other service. PostgreSQL by default ships with SSL turned off on most platforms. The most notable exception is Debian and derivatives (such as Ubuntu), which enable SSL by default. If SSL is disabled globally, your installation is not vulnerable. If this parameter returns off, you are not vulnerable. If it returns on, you are. If you do not need SSL, the easiest fix is to turn this off and restart PostgreSQL. This also brings additional benefits of not paying the overhead of encryption if you don't need it. If you actually use SSL, this is of course not an option. If you have installed PostgreSQL using a package based system, such as yum (from redhat/fedora or from yum.postgresql.org), apt (from debian/ubuntu/etc or from apt.postgresql.org), FreeBSD ports etc, it is up to your operating system to provide a patch. Most major distributions have already done this - you just need to to install it (and restart your services!). If your distribution has not yet updated, you need to convince them to do so ASAP. If you are using a PostgreSQL installation package that bundles OpenSSL, you need an updated version of this package. The most common example of this is the EnterpriseDB Graphical Installers primarily used on Windows and Mac. We expect a new version of these installers to be released within a day or a few. Postgres.app is also vulnerable and needs an update, but is normally not used for servers. The OpenSCG separate download packages are also vulnerable. For each of these you will have to wait for an updated package to show up in the next couple of days. All package maintainers have been notified, so it's only a matter of time. Per the www.postgresql.org download pages we do recommend that you always use the "package manager" system for any platform where this is supported, which means most modern Linux or BSD distributions. If you are currently using one of the above installers on these platforms, a quick fix before the packages are out would be to switch to one of the "package manager" platforms that rely on the operating system update process. This may or may not be an option of course, depending on the complexity of the installation. If you are using a platform where this is not available (such as Windows), your only option is to wait. In PostgreSQL, the SSL negotiation happens before pg_hba.conf is matched. And the vulnerability in OpenSSL is in the negotiation phase. For this reason, even if you have restricted access to your server using pg_hba.conf IP filter rules, or your pg_hba.conf specifies only hostnossl records, this does not protect you. Obviously, if you have an IP level firewall, either at the host or on the network, that will protect you. But pg_hba does not. The pgcrypto module in PostgreSQL uses OpenSSL to provide encryption functions when available. Since the vulnerability is specifically in the protocol negotiation, use in pgcrypto is not vulnerable to this issue. Posted on Mar 16, 2010 at 13:47. Tags: conferences, postgresql, python, schedule, ssl. 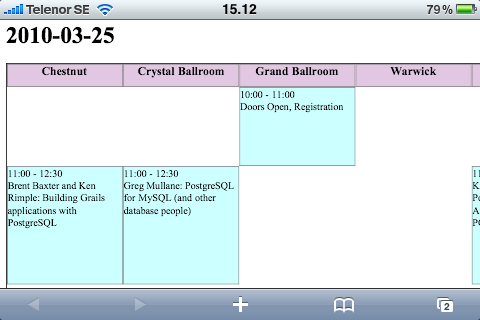 This will be a somewhat different conference than previous PostgreSQL conferences. It's the first big commercial conference. This has enabled it to change venue from "local university or college where rooms are cheap or free" to a conference hotel in downtown Philadelphia. Whether this is actually good for the talks is yet to be seen, but it's likely going to make some things around the conference easier and more integrated. There will also be a exhibition area - something we have tried for pgday.eu without much interest, but it will hopefully be more successful in this surrounding. The contents of the conference are also somewhat different, since there is now a clear focus also on "decision makers", something that many PostgreSQL conferences have been lacking in. We may all want it to be true that the decision makers are the people who are actually going to use the product, but we know that's not true. This gives a conference schedule that contains a broader range of talks than we're used to - this can only be good. If you're like me, you find the official schedule for East very hard to read and basically useless to get an overview. It's also horrible to use from a device like the iPhone, something I'm quite likely to use at the conference. 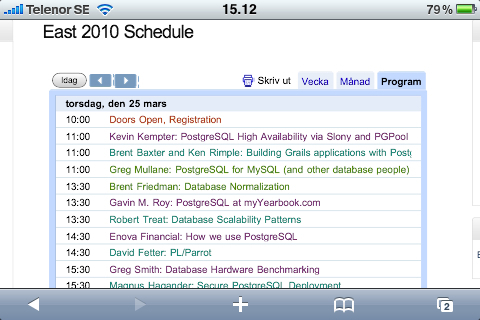 But we solved this problem for the PostgreSQL Europe conferences, and that code is pretty simple. So some copy/paste of a couple of hundred lines of python, some glue code, and voilà, a much more (IMHO) readable schedule. As a bonus, it also generates an aggregate iCalendar feed, that you can plug directly into the calendar application on the iPhone (or I assume most other phones). Google calendar may be very nice to use to work on the schedule, but I find this a lot more user friendly for those reading it - particularly in the ability to get an overview. The page and the feed will both update once per hour by pulling from the official calendar feeds. They will also adjust for the fact that all the official feeds are 3 hours off due to the calendars being set in the wrong timezone. So should they suddenly jump 3 hours that's because the official ones were fixed - just remind me and I'll take out the adjustment. Anybody is free to use them, but of course, usual disclaimers apply, double check with the official one, etc, etc, etc. If you're interested in the code for the aggregator itself, it's up on my github page. And of course, any patches for cool features or just making it look better are always appreciated - it's open source after all. Posted on May 21, 2009 at 17:37. Tags: conferences, encryption, keynote, pgcon, pgcrypto, postgresql, security, ssl, talk. We're now up to the third day of pgcon, the first one of the actual conference - the previous ones being dedicated to tutorials. The day started with Selena, me and Dave doing a semi-improvised keynote. Well, it started with Dan saying welcome and going through some details, but he doesn't count... I doubt we actually spread any knowledge with that talk, but at least we got to plug some interesting talks at the conference, and show pictures of elephants. Missed the start of the Aster talk on Petabyte databases using standard PostgreSQL, but the parts I caught sounded very interesting. I'm especially excited to hear they are planning to contribute a whole set of very interesting features back to core PostgreSQL. This makes a lot of sense since they're building their scaling on standard PostgreSQL and not a heavily modified one like some other players in the area, and it's very nice to see that they are realizing this. After this we had lunch, and I'm now sitting in Greg Smiths talk about benchmarking hardware. This is some very low level stuff compared to what you usually see around database benchmarking, but since this is what sits underneath the database, it's important stuff. And very interesting. The rest of the day has a lineup of some very nice talks, I think. So there'll be no sitting around in the hallway! And in the evening there is the EnterpriseDB party, of course! Yesterday had the developer meeting, where a bunch (~20) of the most active developers that are here in Ottawa sat down together for the whole day to discuss topics around the next version of PostgreSQL, and how our development model works. Got some very important discussions started, and actually managed to get agreement on a couple of issues that have previously been going in circles. All in all, a very useful day.